Magnolia Scales (Neolecanium cornuparvum) & Tuliptree Scales (Toumeyella liriodendri) are both classified within the soft scale group. However, unlike essentially all the other soft scale species they have crawler emergence in August & September instead of in June & July. This fundamental difference is important to recognize in order to time sprays & achieve best controls. 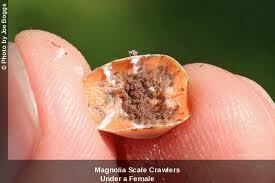 Magnolia scale is the largest soft scale in North America & feeds only on magnolia trees. Tuliptree scale, on the other hand, feeds on both tulip & magnolia trees, but can occasionally be found on a few other species. 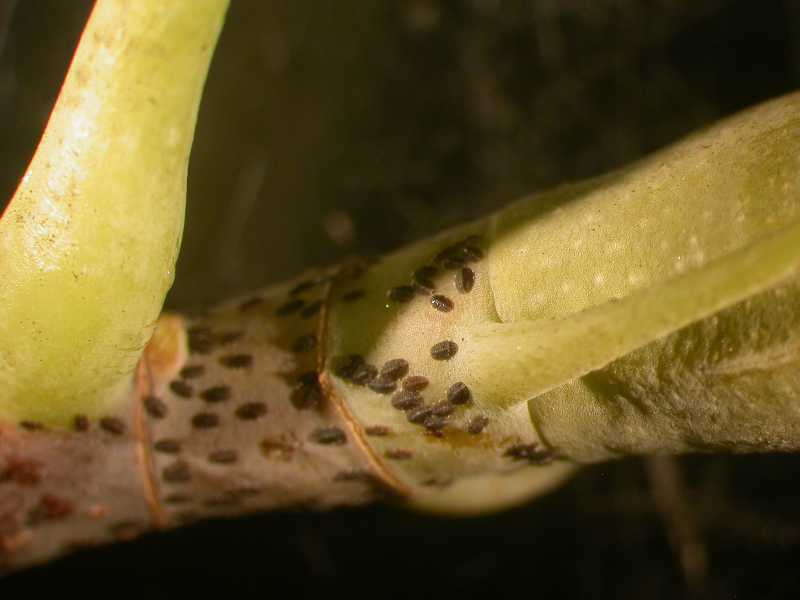 During this past June, July & early August a great deal of honeydew, sooty mold, ants & vespids may have been observed on tulip or magnolia trees infested with either of these soft scales. During that time, the large mature females were using their piecing-sucking mouthparts to withdraw large quantities of sap from the phloem. They subsequently exuded a lot of honeydew that provided a substrate for growth of the black sooty mold fungus. This unsightly appearance often creates the strong tendency to apply premature suppressive spray treatments. If this common mistake was made, then it is recommended that a closer look at the younger branches be made during the next few weeks. If premature, poorly timed sprays were applied, then any previously laid eggs may have been protected underneath the female bodies. Hence, future egg hatch & crawler emergence may have still occurred. 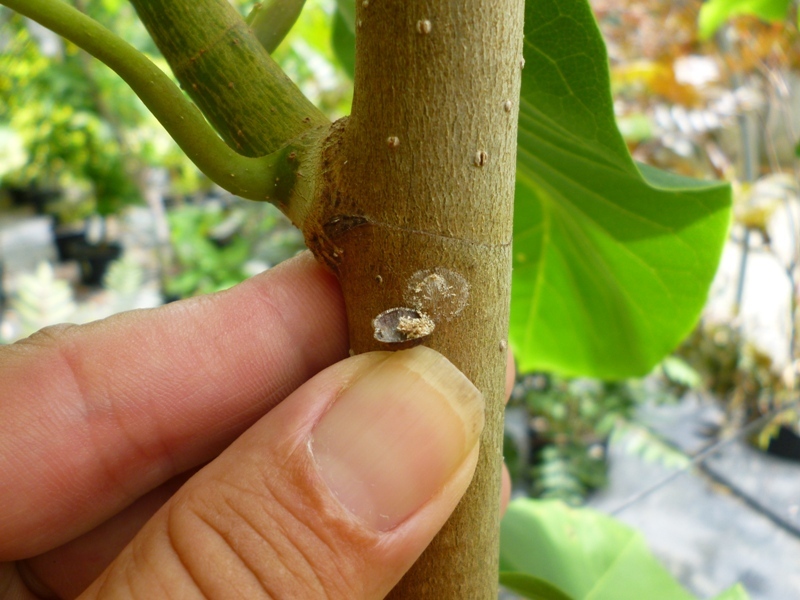 By mid-September, both the Magnolia & Tuliptree scales have been undergoing crawler emergence for nearly a month. 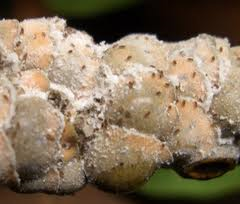 Tuliptree scale crawlers typically emerge approximately one week earlier than the Magnolia crawlers. Even now, at this late date, new crawlers can potentially continue to emerge for another week or two. 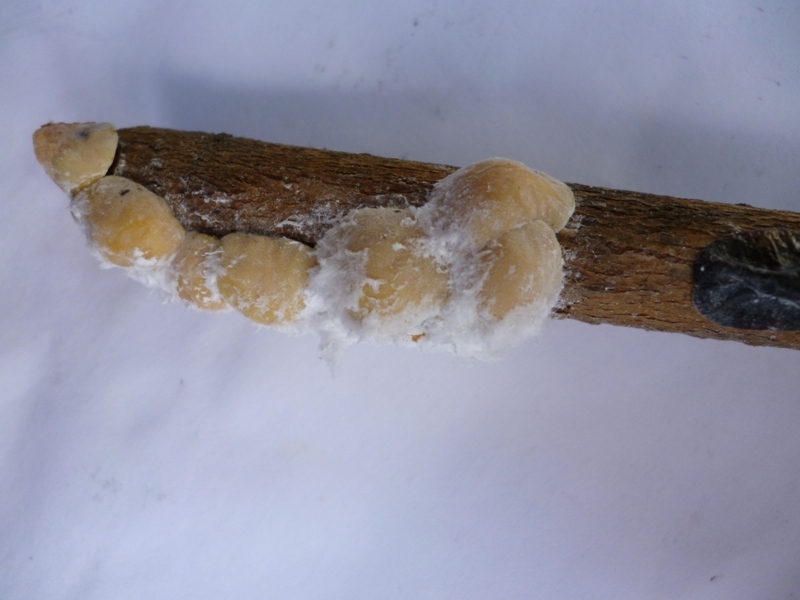 The 1st instar crawlers will have a light brown coloration & can be monitored through direct observation (even without a hand-lens) or by the use of double-sided sticky tape wrapped around branches near the egg-laying females. Both scales reside & feed exclusively on woody tissues during all life stages. They overwinter as larger, dark colored 2nd instar nymphs & can often best be observed on one or two year old wood. Spray controls can be applied during the extended crawler period (6 weeks). However, this may require multiple treatments, especially if short residual materials such as soaps or oils are used. Materials such as pyrethroids can be used to provide a longer residual if it is decided to target the crawlers. Conversely, perhaps a preferred strategy is to delay spray treatments until mid-October. Since the large females die soon after eggs are laid, no further damage to the trees will occur during the crawler emergence period. By the middle of October all crawlers will have emerged & the settled nymphs will be exposed & vulnerable. Horticultural oils will provide good efficacy against the 1st or 2nd instar nymphs of both scales if complete coverage can be achieved. Oils must have direct contact with the target pest to be effective when using either the verdant rate (1-2%) or dormant rate (3-4%). 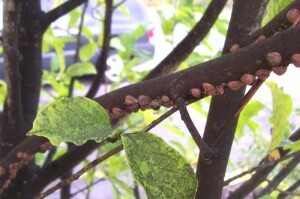 It is difficult to achieve complete coverage of oils when spraying larger trees. A better alternative could be the use of a root or trunk applied systemic insecticide (such as a neonicotinoid), which provide excellent soft scale controls. Interesting predator & prey symbiotic relationships can sometimes be observed with phloem feeding insects such as soft scales & aphids. 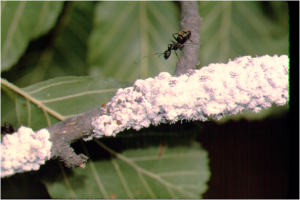 Since ants utilize the honeydew produced by these sap feeders as a food source, they will often expend a lot of effort to protect soft scales & aphids against predators such as lady beetles, lacewings & parasitoid wasps. Ants will guard their honeydew producers & physically fight-off these predators. Sometimes ants may even build protective shelters made of soil to envelope the soft scales. 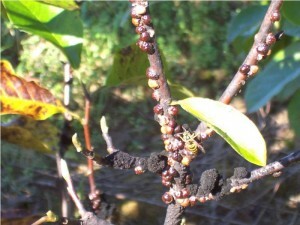 Therefore, it may also be necessary to control ants that are protecting honeydew producing pests. 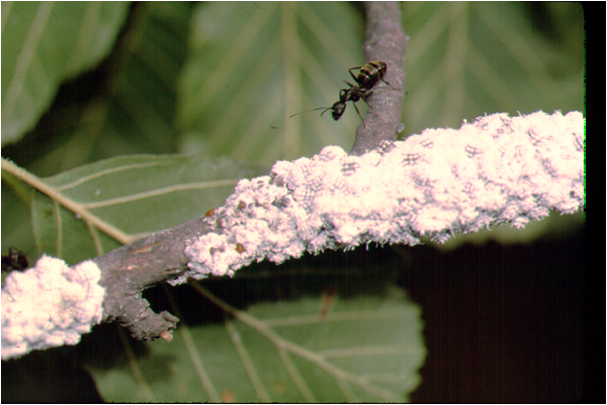 A pyrethroid insecticide barrier applied around the base of the tree trunk can be effective.